The NEW Mola Lumi tilt bracket was created to mount speedlights / lightweight strobes on the existing 22″ Mola Demi (sold seperately). The bracket mounts on alternative screws of the demi, allowing for easy removal of the interior diffuser. 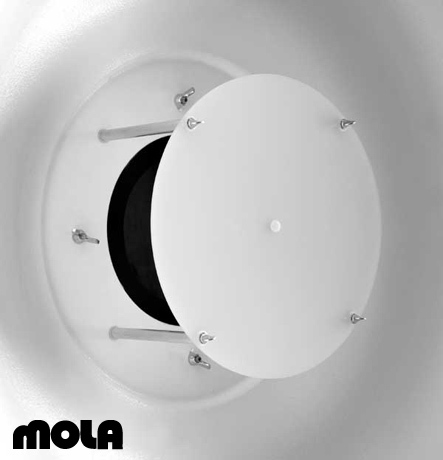 Included with the bracket design is a completely new Lumilux diffuser, specifically optimised for the output of these smaller strobe units to give you the trademark mola-light output. Photos taken with the Lumi / Demi combo will be added to this blog shortly. Further details over at the Mola website here. 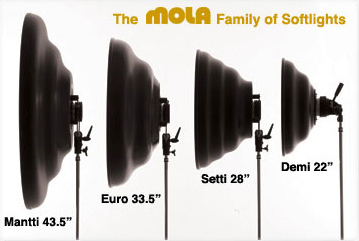 Clever German photographer, Ralph Man, has put together a brilliant video on the 28″ Mola Setti. The action starts at 0:24. He talks about the Setti, its light characteristics and shows a comparison between it and using a softbox. Although this video is in German, you can still get an idea of what he is talking about from the behind-the-scenes and his final images. Ralph runs professional workshops in Germany on lighting and photography. Check out his workshop website here. Another of his videos can be seen by clicking the ‘filme’ link on the above workshop site. We came across photographer Matthew Jordan Smith and His shoot with supermodel, Tyra Banks. a behind-the-scenes look of the above series – The 28″ Mola Setti acting as the main light and the octa as fill. … Fascinating! Check out the full post from Matthew’s blog here with more photos and behind-the-scenes. This time we see the 28″ Mola Setti used for the tv-series of Canada’s Next Top Model.This shoot was from Episode 2 of the 3rd cycle of the programme. One of the girl’s first shoots in the program. The models were photographed individually in a controlled environment and compositioned in for the below group shot. The shooting was done in studio at S1 Studios in Canada. further images are found at this gallery from CNTM website. The 43.5″ Mola Mantti was used for the following Flare Fashion Magazine covers, and editorial shoots inside. 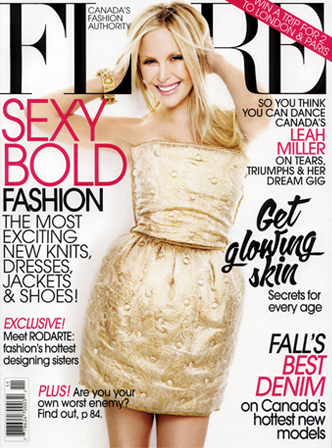 The host of Canada’s So You Think You Can Dance, Leah Miller, graces the cover below! a behind-the-scenes video of the above Cover is linked below – click the image. Although the Mola’s are built like a ‘brick outhouse‘, there is still good reason to keep them cased, especially if you use them on-location. Treekeeperbag – soft christmas Wreath storage bags – 24, 36, 48″ varieties. The smaller dishes can often fit standard Drum cases (as in the boom boom tish drums). They are available in hardcases and your local music store might have some larger, second-hand ones lying around. Buy new from Gator cases, SKB cases etc. 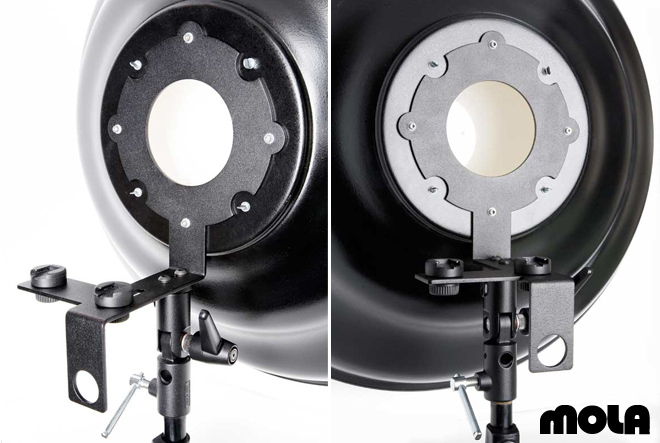 Larger dishes – 28″+ you’ll have to search for the marching bass drum cases. The July 2009 issue of Elle Canada Magazine we see 2 Mola’s being used. 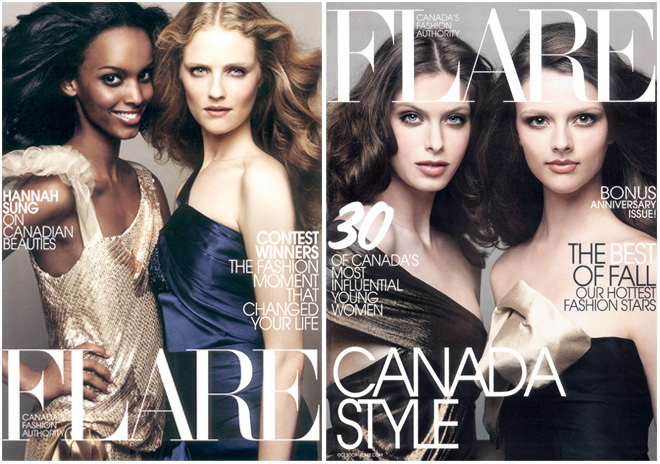 The cover was shot as part of the TV series, Project Runway Canada. 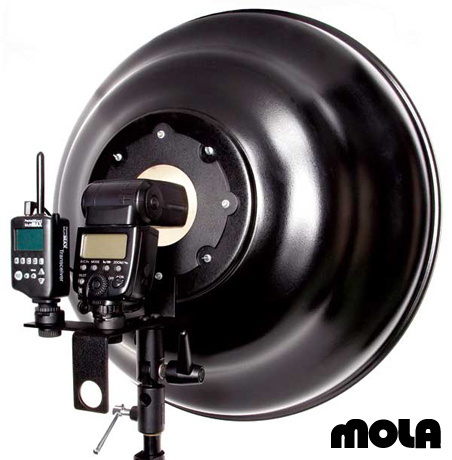 For this cover they used the 43.5″ Mola Mantti. Photography by John van der Schildren. and a pdf document to the cover story here. Here is some excellent, informative articles on the use of a beautydish, including diagrams and resulting images. While not all mention the Mola range of products, each article is excellent on gaining an understanding on the look and unique characteristics a beautydish gives. This list will be added to over time, so bookmark this post! Welcome to the Mola blog! Welcome to the official Mola-Light blog. This blog will provide future news information, answers to frequently asked questions, tutorials, links to Pro Mola users and images taken with Mola products. Seen a Mola somewhere? Send us an email! blog at mola-light.com .